With an advertising slogan: “For gamers, by gamers,” the Razer brand is unmistakably a niche computer hardware maker targeting the gaming markets since its inception in the 90s. 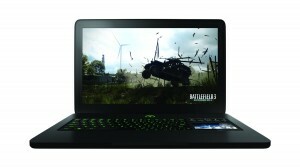 In 2011, the company launched Razer Blade, its first laptop positioned as the first true gaming laptop. It featured a touchpad on the side that made it easier and more comfortable for gamers, along with 10 customizable touchscreen buttons and the unique Naga mouse that has more buttons for the gamer. The latest Razer Blade RZ09-00830500-R3U1 could well be the lightest and slimmest gaming laptop in the market today at a mere 6.6lbs and a super slim 0.88-inch profile. With a 17.3-inch LED-backlit LCD screen with full 1920 x 1080 HD screen, this Razer is powered by a 3rd generation Intel Core i7-3632QM quad core processor clocked at 2.2GHz and 3.2GHz with Turbo Boost, and supported by an 8GB dual channel DDR3 running at 1600MHz. Get it at a ridiculously low price here. 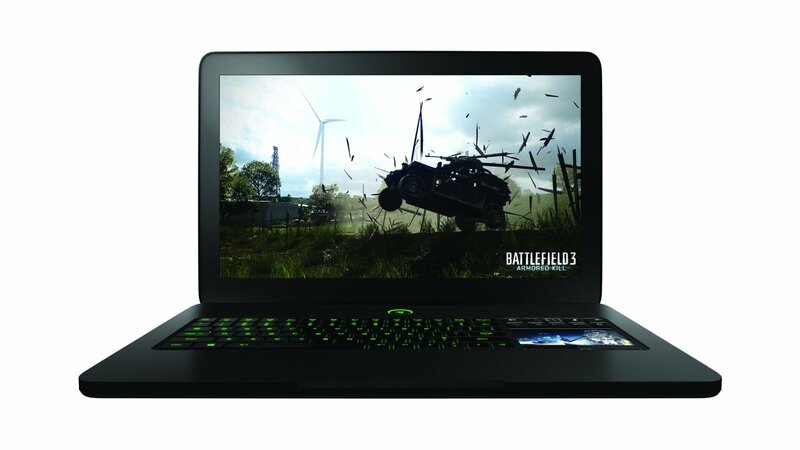 What puts the Razer up there among the gaming laptops to die for is its Nvidia GeForce GTX 660M with its own 2HG GDDR3 video RAM. Just 17% less muscled than the GTX 670M, this graphics card still belongs in the high end GTX 600M series of graphics card for laptops. You can play just about all the sophisticated RPG and FSP games of 2012 at high game settings except for Max Payne 3 and Metro 2033 which are best played on medium setting and Ghost Recon: Future Solder at low game setting. And because the i7 CPU comes integrated with the less muscled Intel HD Graphics 4000 GPU, it supports the NVidia Optimus which allows you to switch between the dedicated GPU and the integrated one. You can play loess demanding games, watch HD movies or do office work on the integrate GPU to conserve battery power. As a multimedia center, the Razer takes advantage of its gorgeous HD screen to play downloaded HD movies. Its internal speakers are above average, but you can benefit from its HDMI out to play an enveloping 7.1 surround sound with its Dolby Home theater v4 from any competent HiFi home entertainment system. Lightweight and slim do not come cheap, especially for a gaming laptop of this caliber. The Razer Blade will make you $2,499 poorer when more muscled can fetch $500 less. But then those cheaper gaming laptops are an inch thicker and borders on the backbreaking 10lbs weight class. Taking out the optical drive allows this model to be thin and light as most gamers download their games anyway or run them from a cloud computing site. It is, therefore, not for gamers who still find optical drives useful. Its 500GB drive will certainly need upgrading if you want to archive a few more HD movies or settle with an external drive that can defeat its superb portability if you have to bring it along. Lastly, its switchblade UI can be quirky and not for every gamer. We expect this to get improved considering this is their first implementation of this feature. The Razer Blade certainly lives up to its tradition and market position as a gaming laptop for serious gamers. There are more muscled gaming laptops out there but this Razer successfully blended the needed raw power to play all the demanding games from medium to high setting with elegant portability that is sure to attract even non-gamers. If the price is not a problem, this laptop makes for a satisfying gaming experience with multimedia on the side. Buy it now at a very good price here.